So with what is available to the developer and limitations of the OS itself (ie sharing), SymPaper is really about as good as a Read It Later client can get on Symbian and is equal to other platforms, and I say this having also used the rather good official Android client for the last month in tandem. Read It Later lets you save what you find on the web to watch and read on any device, at any time. It’s been called “a DVR for the web” by the New York Times, Business Week, Time, TechCrunch and more. A simple and straight to the point explanation that captures the essence of the service. The key to Read It Later is it’s incredible cross platform reach with official Android and iOS apps, as well as third party apps on Symbian, Blackberry, Windows Phone, WebOS and MeeGo/Harmattan. While third party apps were quite limited compared to the official ones, Read It Later has now allowed developers access to more features for their apps and as expected these have made their way back to SymPaper. The app has also received performance/under the hood tweaks and a design refresh. SymPaper now gives the user more control over not only how sync is handled but also what gets synced. As in previous versions, users can still toggle whether syncing of articles is automatic at start-up or handled manually by the user. Now users also have control over what content gets fetched by the app and also how many articles get fetched. You can choose to fetch all content or just unread content. There is a view filter in the main article list but for some users it would be preferable to have global control, particularly in light of data costs. From my experience the app does have a relatively small data footprint. The second major change is being able to control how many articles get fetched at a time, with the option of 50, 100, 250 and 500 articles, again useful for data conscious users. Search has also been improved in SymPaper. The search mode can be toggled here with the options set to Search Article Titles or Search Article Content. Previously search was limited to just the titles but now the user can search the full body of the article making finding content from archived articles a breeze. The bulk of changes for SymPaper are in article mode. The choice of dark or light theme, and independant control of list and article theme is present, great for me as I like a dark list theme and a light article theme. 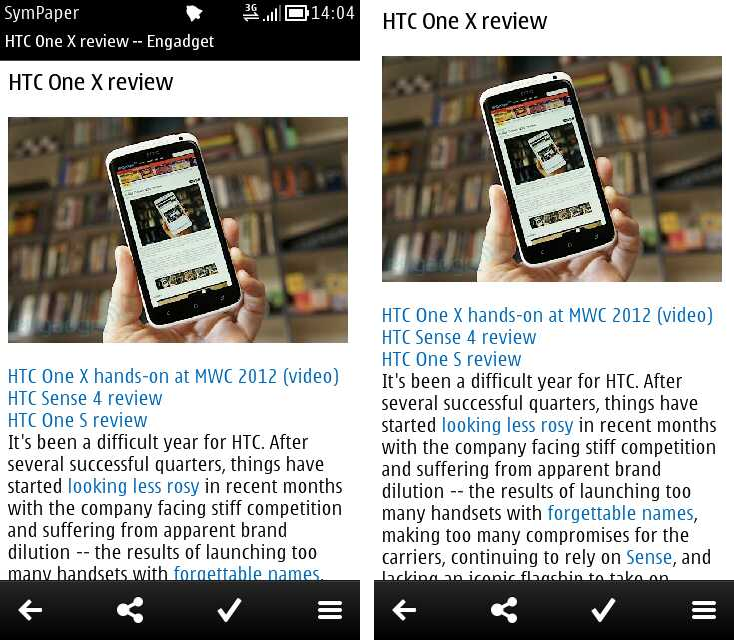 One of the most eagerly awaited features has finally made it to SymPaper; Image Preview. This behaves slightly differently to article fetching where these are downloaded and stored on the phone. Image download is handled on a per session and per article basis so in essence embedded images are downloaded on the fly. On a fast internet connection one will hardly notice the latency but when I’m on EDGE, there is a very noticeable delay from opening an article and having images presented. It’s a minor gripe really as this is a feature that has been on the cards for a while. At this stage there is no support for video due to some limitations with Qt and Flash support. Sympaper now features finer control over font sizes in an article. Previously this was set in the article and was limited to just two sizes, but now there is a choice of four different font size for articles. Impressive. 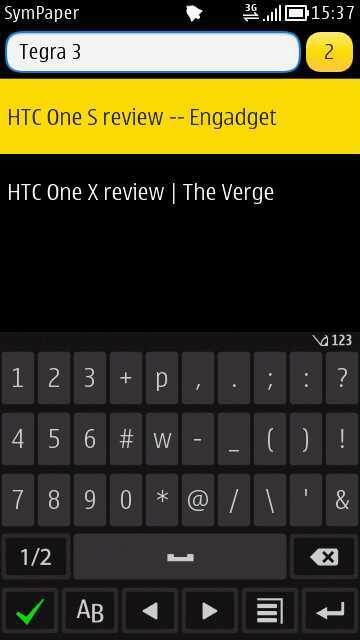 To better utilize the screen real estate, SymPaper now features a maximised reader mode. All this essentially done is remove the status bar in reader mode and the article title bar is no longer fixed at the top compared to standard mode. User who want less to think about while they are powering through their saved articles now have an Automatically Mark as Read option. As soon as an article is opened it is marked as read, meaning there’s one less thing to worry about. It’s a feature that I will not be using much as I prefer to mark the article as read when I get to the end, in case I don’t get to the end of a very long article for example. Luckily in any case, this has been thought through in the design of the app, and in article mode there is a mark as unread icon in the toolbar for previously read articles. In list mode, SymPaper now brings a contextual long press menu for articles in the list. This allows one the following options for unread articles; read article, rename article, mark as read, open in browser and delete, with the last option removing the article from local storage and server. The long press menu is a great usability enhancement for article management as previously the user had to open the article to perform all the functions on the list. 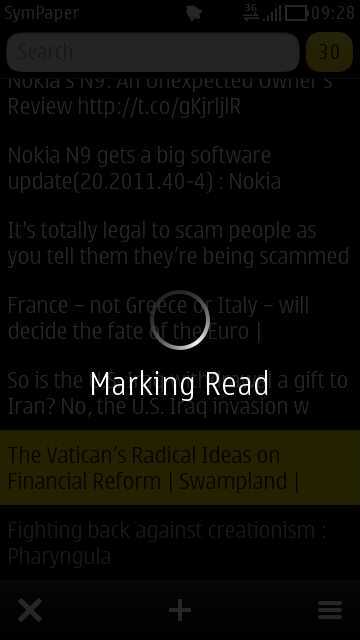 For read articles, mark as read is predictably replaced with mark as unread. A welcome addition to SymPaper’s feature set is editing of article titles, particularly useful when articles are sent to Read It Later from third party apps like Twitter clients; the title is usually displayed as part of the tweet. 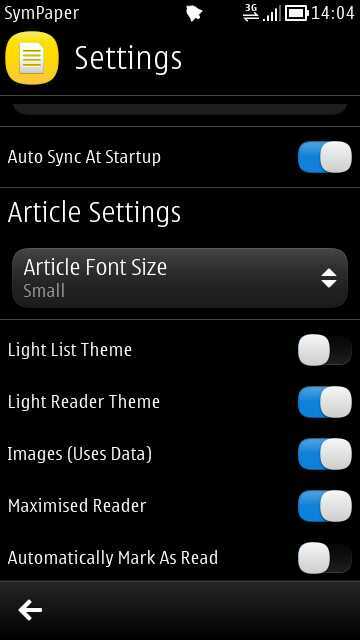 The design of SymPaper has been tweaked now built using Qt Quick Components to bring the app fully in line with Symbian Nokia Belle design guidlines. This result in a consistent user experience that is similar to other apps on the phone and general system UI. Every aspect of the app is tight, clean and refreshing. Performance wise, the app is an absolute delight to use. Scrolling is responsive, opening articles, launching menus, witching back and forth between screens is all sleek and ultra snappy. There are animations to remind you when the app is busy. I can also report that the app is remarkably stable, with not a single crash to report in my time of using the app. All in all, SymPaper continues to impress and also shows that Symbian as a platform is capable of providing the user base with access to some really useful modern day services where the platform might be overlooked through official channels. 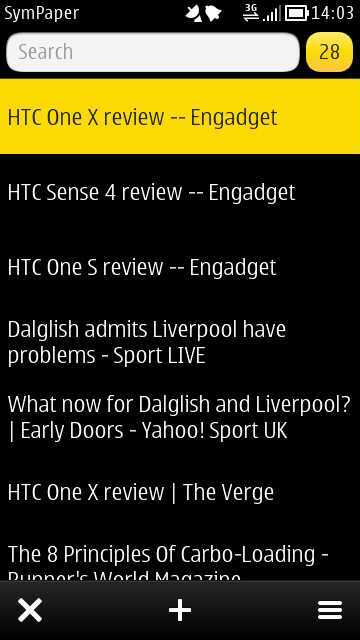 Having purchased Read It Later Pro for Android, I can honestly say that Symbian users are not getting an inferior experience with SymPaper. It really is a testament to how much thought and work has gone into putting together the application. In fact I can think of only three features that SymPaper lacks in comparison to the Android app, background downloading of articles, syncing of read position to the web app and an integrated browser for viewing full versions of articles. It must be said that the first two features are unique to the Android experience with even the iOS app not getting a bite of that cherry. The only feature then than could be included which would complete the app is an integrated browser, Gravity style, for viewing the rich versions of articles. 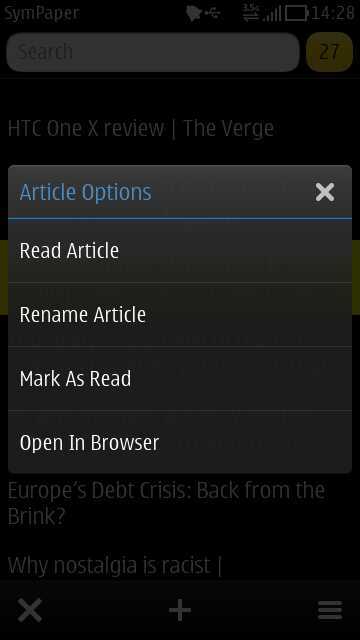 As things stand SymPaper launches the default browser, with the option to copy URLs for pasting into apps like Opera Mini for example (not recognized as a browser by Symbian). I have been informed however that the one issue there would be that Flash cannot be enabled in QML Webview, so video content would not be displayed. At version 3.3, SymPaper is along with Gravity, one of the shining lights for Symbian, an exquisite slice of joy that all apps should aspire to emulate. It brings a host of features, great performance and an appreciable level of control for the user to tailor their reading later experience as they see fit. For example, mine auto syncs articles at start-up, fetches only unread articles, i have a dark list theme, a light reader theme in maximised mode, with small fonts, images downloaded and I manually mark articles as read. How will you personalize your reading later experience on SymPaper? This is one of my favourite apps too. 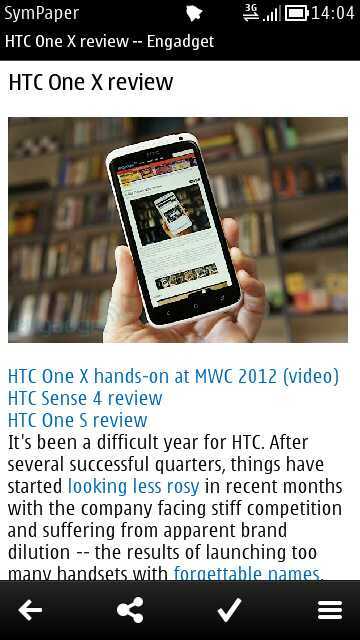 Superb review, can’t wait for the updates. 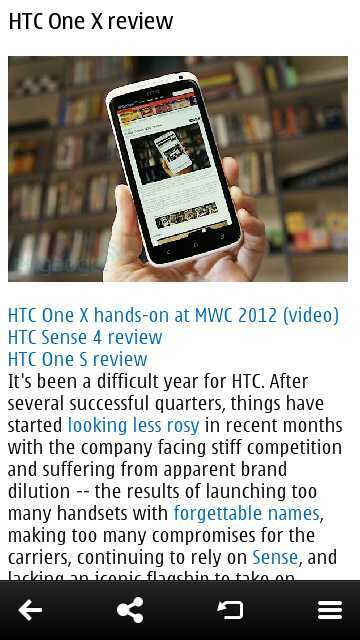 Especially liked the image preview, font settings and article content search function. Will give it a try I think. 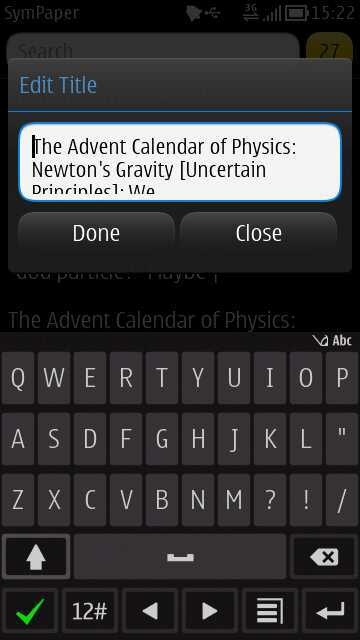 3G where I am is pretty ordinary but I will support SymPaper just as I have supported Gravity for a long time. p.s. Will be interested in due course to read your thoughts on Windows Phone and where that is headed and what if anything it can offer Nokia tragic’s like myself.